Lebanon's Minister of Economy & Trade, H.E. 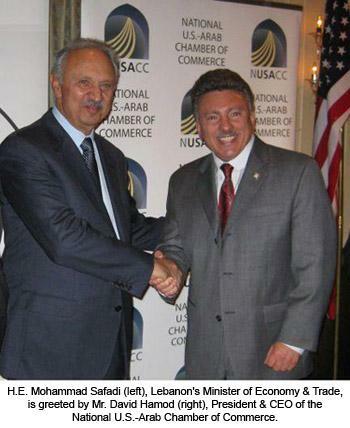 Mohammad Safadi, was honored last night at a reception in Washington DC co-hosted by the National U.S.-Arab Chamber of Commerce (NUSACC) and the Safadi Foundation-USA. More than 150 American and Lebanese business leaders attended the event, which wrapped up the minister's week-long visit to the United States. While in the nation's capital, Minister Safadi met with a wide variety of policymakers. His visit to the United States served to strengthen commercial relations and economic reform through the business community and non-governmental organizations (NGOs). He emphasized that reform can still occur in Lebanon that not only drives growth, but also creates political momentum for reform and has a significant economic and social impact on Lebanese society. Minister Safadi's visit "sent a very positive message about the state of Lebanon's economy and the increasingly important role of the private sector as an economic driver," stated David Hamod, President & CEO of the National U.S.-Arab Chamber of Commerce. "Lebanon has helped to set the pace for the whole region during the economic downturn, a fact that is not being lost on international investors, including U.S. companies looking to expand their regional presence." The Doha Agreement reached by rival Lebanese factions during the spring of 2008 brought to an end an 18-month-long political crisis and laid groundwork for the election of a new government. This has prompted Lebanon's leadership to get "back to the business of business," restoring the confidence of local and foreign investors. Lebanon bucked regional economic trends in 2009, resulting in an increase in foreign direct investment by 20 percent to $4.3 billion, up from $3.6 billion in 2008. According to the most recent data analyzed by the National U.S.-Arab Chamber of Commerce, real GDP growth in Lebanon is expected to grow to 5.8 percent this year. Imports of U.S. merchandise are expected to surpass $2 billion in 2010, as U.S. market share in Lebanon grows two percentage points to 11.2 percent. In remarks at the Woodrow Wilson Center in Washington this week, Minister Safadi said the financial crisis that has engulfed most of the world's economies has had little effect on Lebanon. He cautioned, however, that growth will not continue indefinitely in Lebanon without reforms. He emphasized that the Lebanese government and the business community need to work together to create opportunities for Lebanon's youth to find jobs within the country. Without such opportunities, the minister warned, Lebanon's new generation of youth leaders is likely to emigrate in search of work. Safadi Foundation-USA is a registered 501 (c)(3) organization dedicated to Lebanon's human development. Founded in 2008 and inspired by the resilience of the Lebanese people, the organization seeks to strengthen the capacity of civil society. In parallel to its work with civil society, the Foundation serves as an educational resource for policies that promote the growth of strong and independent state institutions dedicated to the rule of law, good governance and sustainable human development.